elevating him to the rank of the WSEAS Fellow. Up to now only Prof. Zadeh and Prof. Sifakis have received this recognition. Embedded systems are components integrating software and hardware that are jointly and specifically designed to provide given functionalities, which are often critical. They are used in a very wide array of application areas - including transport, consumer electronics / electrical appliances, energy distribution, manufacturing systems, etc. Designing embedded systems requires techniques taking into account extra-functional requirements regarding optimal use of resources such as time, memory and energy while ensuring autonomy, reactivity and robustness. Jointly taking into account these requirements raises a grand scientific and technical challenge: extending Computer Science with paradigms and methods from Control Theory and Electrical Engineering. Computer Science is based on discrete computation models, which are by their nature are very different from the analytic models used in other engineering disciplines, because they do not encompass physical time and resources. We discuss the main aspects of this challenge and their associated research directions for different areas such as modelling, programming, compilers, operating systems and networks. Joseph Sifakis is CNRS researcher and the Founder of Verimag laboratory (http://www-verimag.imag.fr/), in Grenoble, France. He studied Electrical Engineering at the Technical University of Athens and Computer Science at the University of Grenoble. Verimag is a leading research laboratory in the area of critical embedded systems. It developed the underlying theory and technology for the SCADE tool, used by Airbus for the design and validation of its critical real-time systems, and is becoming a de facto standard for aeronautics. Verimag has a lasting and strategic collaboration with ST Microelectronics, France Telecom R&D, and Airbus, through which numerous results on validation and testing have been transferred. Joseph Sifakis is recognized for his pioneering work on both theoretical and practical aspects of Concurrent Systems Specification and Verification. He contributed to emergence of the area of model-checking, currently the most widely-used method for the verification of industrial applications. His current research activities include component-based design, modeling, and analysis of real-time systems with focus on correct-by-construction techniques (http://www-verimag.imag.fr/~sifakis/). Joseph Sifakis has broad experience with industry, notably though joint projects with partners such as Astrium, the European Space Agency, France Telecom, ST Microelectronics and he has also been active for many years in consulting. 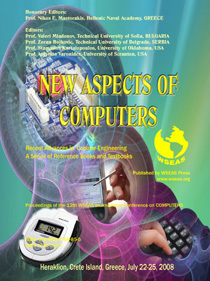 Joseph Sifakis is the Scientific Coordinator of the European Network of Excellence ARTIST2 on Embedded Systems Design. (http://www.artist-embedded.org/). This network gathers 35 of the best European teams in the area, and aims to produce innovative results for cost-effective design of dependable embedded systems. It will also promote innovative methods safe and secure systems, notably through cooperation with key European industrial partners such as Thal?, Airbus, Ericsson, Philips, and ST Microelectronics. Joseph Sifakis is the chair of "Chamber B" (Public Research Organisations) of ARTEMISIA, which is the Industrial Association within the ARTEMIS European Technology Platform on Embedded Systems (http://www.cordis.lu/ist/artemis/). Joseph Sifakis is the director of the CARNOT Institute "Intelligent Software and Systems" in Grenoble. Joseph Sifakis is a member of the editorial board of several journals, co-founder of the International Conference on Computer Aided Verification (CAV) and a member of the Steering Committee of the EMSOFT (Embedded Software) conference. 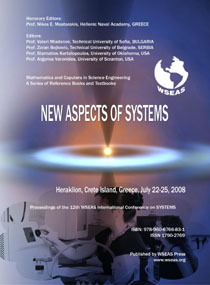 Joseph Sifakis has received with Ed Clark and Allen Emerson for their contribution to Model Checking, the Turing Award for 2007 (http://awards.acm.org/homepage.cfm?srt=all&awd=140). He is also the recipient of the CNRS Silver Medal in 2001. Joseph Sifakis is a WSEAS Fellow. Abstract: Envisioned applications of wireless sensor networks (WSNs) include surveillance, monitoring and tracking tasks. These motivate well decentralized estimation and smoothing of deterministic and (non)stationary random signals using (possibly correlated) observations collected across distributed sensors. In this talk we present state-of-the-art algorithms for consensus-based distributed estimation using ad hoc WSNs where sensors communicate over single-hop noisy links. The novel framework reformulates basic estimation criteria such as least-squares, maximum-likelihood, maximum a posteriori, and linear mean-square error, as decomposable, constrained, convex optimization problems that are amenable to distributed solutions. The resultant distributed estimators are provably convergent to their centralized counterparts and robust to communication noise. Besides stationary, the framework encompasses adaptive filtering and smoothing of non-stationary signals through distributed LMS and Kalman filtering. G. B. Giannakis received his B.Sc. in 1981 from the Ntl. Tech. Univ. of Athens, Greece and his M.Sc. and Ph.D. in Electrical Engineering in 1983 and 1986 from the Univ. of Southern California. Since 1999 he has been a professor with the Department of Electrical and Computer Engineering at the University of Minnesota, where he now holds an Endowed ADC Chair in Wireless Telecommunications. His general interests span the areas of communications, networking, signal processing, estimation and detection theory -- subjects on which he has published more than 270 journal papers, 450 conference papers, two research monographs and two edited books. Current research focuses on wireless networks, complex-field and space-time coding, ultra-wideband and cognitive radios, cross-layer designs and wireless sensor networks. He is the (co-) recipient of six best paper awards from the IEEE Signal Processing (SP) and Communications Societies (1992, 1998, 2000, 2001, 2003, 2004) and also received the SP Society's Technical Achievement Award in 2000 as well as the EURASIP Technical Achievement Award in 2005. He is an IEEE Fellow since 1997, and a frequent participant in WSEAS Conferences. Abstract: Human eyes receive more than 75% of the total information accessible to the human senses. ?There are approximately 45 million blind individuals world-wide according to the World Health Report. Vision loss can be very traumatic, leading to frustration and depression. According to the American Foundation for the Blind (AFB), the rate of unemployment among legally blind individuals of working age residing in the United States (58%) is much greater than that of individuals with no functional limitations (18%). Employment opportunities and independence are scarce for visually impaired individuals. This is unfortunate in view of the fact that ingenious devices [IEEE Spectrum] and information technology (IT) strategies can be developed to help people overcome these barriers and to pursue educational opportunities that will allow them to become productive members of society.? In this talk technological efforts are presented that have the same goal assisting and increasing the visual impaired people?s independence in their working and living environment, and reducing their social neglect ness. In particular, the research effort (called Tyflos) is presented here that is an IT- based wearable system-prototype. It consists of a pair of dark glasses on which two tiny vision cameras, an ear speaker and a microphone are attached. The cameras are connected with a portable computer that carries intelligent software programs. The cameras, under the user?s command, capture images from the surrounding and convert them via software programs into audio or vibrations. The current versions of Tyflos is used as 1) a reader by reading books or the blind user via audio conversion and 2) a navigation by converting 3D images into vibrations for navigation. Nikolaos G. BOURBAKIS (IEEE Fellow) received his PhD in computer engineering and informatics in 1983. He currently is the Associate Dean for Engineering Research, a Distinguished Professor of Informatics and the Director of the ATR Center at WSU. He has directed several research projects (Applied AI, Image Processing & Machine Vision, Visual Autonomous Navigation, Information Security, Bio-Informatics, Biomedical Engineering) funded by government and industry, and he has published near 300 papers in International refereed Journals, Conference proceedings and book-chapters. Previous working places: SUNY, IBM, UP, GMU. He is actively involved as an Associate Editor in several IEEE and International Journals and General Chair in numerous International IEEE Conferences. He is the EIC of the Artificial Intelligence Tools Int. Journal (WSP) and the new upcoming Bioinformatics Engineering Journal. He is an IEEE Computer Society Distinguished Speaker, and NSF University Research Programs Evaluator, an IEEE Computer Society Golden Core Member. He has received several high prestigious awards, some of them are: IBM Author recognition Award 1991, IEEE Computer Society Outstanding Contribution Award 1992, IEEE Outstanding Paper Award ATC 1994, IEEE Computer Society Technical Research Achievement Award 1998, IEEE I&S Outstanding Leadership Award 1998, IEEE ICTAI 10 years Research Contribution Award 1999, IEEE BIBE Leadership Award 2003, ASC Recognition Award 2005. This was the first participation of Prof. Bourbakis in WSEAS. Abstract: Depth of field refers to the swath through a 3D scene that is imaged in acceptable focus through an optics system, such as a camera lens. It is a vitally important component of real photographs, and is useful as a tool for drawing the viewer's eye to the important part of the image. Depth of field is equally important for computer-generated images. This talk will provide an explanation of the phenomenon of depth of field and a survey of a variety of techniques to render depth of field effects in computer graphics, with particular attention devoted to the trade-offs between image quality and algorithm efficiency. Algorithms to render highly accurate depth of field effects, such as distributed ray tracing or the accumulation buffer, are sampling methods that use large numbers of samples, with high computational cost. Sampling is inherently slow because it effectively requires rendering the scene many times, which multiplies the render time by a potentially large factor. Faster algorithms are based on a post processing approach, which operates in image space. Post process methods operate on 2D images along with depth information, rather than working with a full 3D object representation as the sampling methods do. Consequently, post process methods struggle to accurately simulate the underlying optical process, and tend to suffer from artifacts or avoid those artifacts at a large cost. The talk will include an analysis of the nature of these artifacts. Brian A. Barsky is Professor of Computer Science and Affiliate Professor of Optometry and Vision Science at the University of California at Berkeley. He is a member of the Joint Graduate Group in Bioengineering, an interdisciplinary and inter-campus program, between UC Berkeley and UC San Francisco. He was a Directeur de Recherches at the Laboratoire d'Informatique Fondamentale de Lille (LIFL) of l'Universit?des Sciences et Technologies de Lille (USTL). He has been a Visiting Professor of Computer Science at The Hong Kong University of Science and Technology in Hong Kong, at the University of Otago in Dunedin, New Zealand, in the Mod?isation G?m?rique et Infographie Interactive group at l'Institut de Recherche en Informatique de Nantes and l'Ecole Centrale de Nantes, in Nantes, and at the University of Toronto in Toronto. Prof. Barsky was a Distinguished Visitor at the School of Computing at the National University of Singapore in Singapore, an Attach?de Recherche Invit?at the Laboratoire Image of l'Ecole Nationale Sup?ieure des T? ?ommunications in Paris, and a visiting researcher with the Computer Aided Design and Manufacturing Group at the Sentralinsitutt for Industriell Forskning (Central Institute for Industrial Research) in Oslo. He attended McGill University in Montr?l, where he received a D.C.S. in engineering and a B.Sc. in mathematics and computer science. He studied computer graphics and computer science at Cornell University in Ithaca, where he earned an M.S. degree. His Ph.D. degree is in computer science from the University of Utah in Salt Lake City. He is a Fellow of the American Academy of Optometry (F.A.A.O.). He is a co-author of the book An Introduction to Splines for Use in Computer Graphics and Geometric Modeling, co-editor of the book Making Them Move: Mechanics, Control, and Animation of Articulated Figures, and author of the book Computer Graphics and Geometric Modeling Using Beta-splines. He has published 120 technical articles in this field and has been a speaker at many international meetings. Dr. Barsky was a recipient of an IBM Faculty Development Award and a National Science Foundation Presidential Young Investigator Award. He is an area editor for the journal Graphical Models. He is the Computer Graphics Editor of the Synthesis digital library of engineering and computer science, published by Morgan & Claypool Publishers, and the Series Editor for Computer Science for Course Technology, part of Cengage Learning. He was the editor of the Computer Graphics and Geometric Modeling series of Morgan Kaufmann Publishers, Inc. from December 1988 to September 2004. He was the Technical Program Committee Chair for the Association for Computing Machinery / SIGGRAPH '85 conference. He was Plenary Speaker in 4 parallel WSEAS events in Brazil in 2005. He has also some regular papers in WSEAS Conferences. His research interests include computer aided geometric design and modeling, interactive three-dimensional computer graphics, visualization in scientific computing, computer aided cornea modeling and visualization, medical imaging, and virtual environments for surgical simulation. He has been working in spline curve/surface representation and their applications in computer graphics and geometric modeling for many years. He is applying his knowledge of curve/surface representations as well as his computer graphics experience to improving videokeratography and corneal topographic mapping, forming a mathematical model of the cornea, and providing computer visualization of patients' corneas to clinicians. This has applications in the design and fabrication of contact lenses, and in laser vision correction surgery. His current research, called Vision-Realistic Rendering is developing new three-dimensional rendering techniques for the computer generation of synthetic images that will simulate the vision of specific individuals based on their actual patient data using measurements from a instrument a Shack-Hartmann wavefront aberrometery device. This research forms the OPTICAL (OPtics and Topography Involving Cornea and Lens) project. Abstract: Queueing network theory has been successfully applied by computer and communication system modelers to represent the inherent contention and congestion in multiple resource systems, to identify the system bottlenecks, and to assess the performance limits. A queueing network model provides a suitable framework for analyzing the performance of ?connection-less services? in a packet switched network. The so-called ?product-form? networks such as Jackson network and its generalizations, allow such performance metrics as throughput and the mean delay to be represented by a ratio of the ?normalization constants? with different arguments. Connection-oriented services, such as the conventional circuit-switched telephone networks and end-to-end flow connections over the Internet can be properly represented by loss network models. The loss network theory is a relatively recent development, and can be viewed as an extension of the classical Erlang and Engset loss models. We will discuss interesting relations between queueing networks and loss networks, and show that the computational algorithms developed for queueing networks are equally applicable to the normalization constants and performance metrics in loss networks as well. Finally, we will discuss the case of large systems, where even most efficient algorithms for exact solutions are computationally infeasible. Recent development for approximation techniques and asymptotic performance limits will be reviewed. 2. H. Kobayashi and B. L. Mark, ?Product-Form Loss Networks,? in Frontiers in Queueing (ed. J. H. Dshalalow). pp. 147-195, CRC Press, 1997. 3. F. P. Kelly, ?Loss Networks,? Ann. Appl. Prob., vol.. 1, no. 3, pp 319-378, 1991. Hisashi Kobayashi is the Sherman Fairchild University Professor of Electrical Engineering and Computer Science at Princeton University since 1986, when he joined the Princeton Faculty as Dean of the School of Engineering and Applied Science (1986-91). Prior to joining Princeton he worked for the IBM Research Division for 19 years (1967-86). He was the founding director of IBM Tokyo Research Laboratory (1982-86). He received his BS (1961) and MS (1963) from Tokyo University and his MA (1966) and Ph.D.(1967) from Princeton. He was a radar engineer at Toshiba, Japan (1963-65). His principal fields of research are system modeling and analysis, queuing theory and signal processing algorithms. He has also worked on data transmission theory, digital magnetic recording, optical network architectures, wireless geolocation algorithms, and network security. He was a recipient of the 2005 Eduardo Rhein Technology Award of Germany for his 1969 invention of a high-density digital recording scheme, now widely known as PRML (partial response coding, maximum likelihood decoding). He is an IEEE Fellow (1977), IEEE Life Fellow (2003), and IEICE Fellow (2004). He received the Humboldt Prize of West Germany (1979) and IFIPS Silver Core (1980), and is a member of Japan?s National Academy of engineering (1992). He published ?Modeling and Analysis? (Addison Wesley, 1978) , coauthored with Brian Mark a textbook ?System Modeling and Analysis? (Pearson-Prentice Hall, 2008) and is currently working on ?Probability, Random Processes and Statistical Analysis,? to be published by Cambridge University Press in 2009. Abstract: Optical networks are considered to be intrusion-resistant by virtue of the fiber medium. The common belief is that the optical fiber is difficult to tap, as compared to copper wire and to wireless media. In fact, this is a simplistic view because stripping a cable and tapping a fiber with tools that are commercially available is a relatively simple task to the sophisticated intruder. Moreover, because the fiber link is many kilometers long, the fiber cannot be guarded; this presents a tremendous opportunity and flexibility to the intruder to select the point of intrusion unnoticed. Therefore, it is important that the network is sophisticated enough to monitor and detect intrusions, differentiate from possible component failure and degradation, and upon detection of fiber attacks, it executes automatic countermeasures, outsmarting the intruder. In this talk, we describe automatic intrusion detection methods and countermeasure strategies in modern optical networks. Stamatios V. Kartalopoulos, PhD, is currently the Williams Professor in Telecommunications Networking at the University of Oklahoma. His research emphasis is on optical communication networks (FSO, long haul and FTTH), optical technology including optical metamaterials, and optical communications security including quantum cryptography and key distribution. Prior to this, he was with Bell Laboratories where he defined, led and managed research and development teams in the areas of DWDM networks, SONET/SDH and ATM, Cross-connects, Switching, Transmission and Access systems. He has received the President?s Award and many awards of Excellence. He holds nineteen patents in communications networks, and he has published more than hundred scientific papers, seven reference textbooks important in advanced fiber optic communications, and has also contributed chapters to other books. Dr Kartalopoulos is an IEEE Fellow, chair and founder of the IEEE ComSoc Communications & Information Security Technical Committee, member at large of IEEE New Technologies Directions Committee, and he has served as editor-in-chief of IEEE Press, chair of ComSoc Emerging Technologies and of SPCE Technical Committees, Area-editor of IEEE Communications Magazine/Optical Communications, member of IEEE PSPB, and VP of IEEE Computational Intelligence Society. 40 other Plenary Speakers accompanied the previous Invited Keynote Speakers. by Prof. Georgios B. Giannakis, University of Minnesota , USA. by Dr. Nikolaos G. Bourbakis, Wright State University, USA. by Prof. Brian A. Barsky , University of California, Berkeley, U.S.A.
by Prof. Sergey Ryvkin, Trapeznikov Institute of Control Sciences of Russian Academy of Sciences, Russia. by Prof. Noel Y. A. Shammas, Staffordshire University, UK. by Prof. Francesco Muzi, University of L?Aquila, ITALY. by Prof. Ernst D. Schmitter, University of Applied Sciences, Germany. by Prof. Chih-Min Lin, Yuan-Ze University , Taiwan. by Prof. Urszula Ledzewicz, Southern Illinois University , USA. by Prof. Milan Stork, University of West Bohemia , Czech Republic. by Prof. Constantin Udriste, University Politehnica of Bucharest , ROMANIA. by Prof. George Vachtsevanos, Georgia Institute of Technology , U.S.A.
by Prof. Humberto C?ar Chaves Fernandes, Federal University of Rio Grande do Norte, Brazil. by Prof. Hisashi Kobayashi, Princeton University, USA. by Prof. Stamatios Kartalopoulos, University of Oklahoma, USA. by Prof. Michael Bank, HIT-Holon Institute of Technology, Israel. by Prof. Peter Stavroulakis, Technical University of Crete, GREECE. by Prof. Norio Shiratori, Tohoku University, Japan. by Prof. Marcin Kaminski , Technical University of Ł?ź, Poland. by Prof. Abdel-badeeh M. Salem , Ain Shams University, Egypt. by Prof. Eugene Kindler , University of Ostrava, Czech Republic. by Prof. Sotirios G. Ziavras , New Jersey Institute of Technology, U.S.A.
Collaborative learning in the university education: from the theory to the practice. by Prof. Jaime Lloret Mauri, Polytechnic University of Valencia, SPAIN. by Dr. Michail Kalogiannakis, Researcher University Paris 5 - Ren? Descartes, FRANCE. by Assoc. Prof. Azami Zaharim, National University of Malaysia, MALAYSIA. by Professor Andrei Kolyshkin, Riga Technical University, LATVIA. 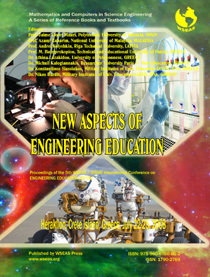 by Prof. M. Hatziprokopiou, Technical and Educational University of Patras, GREECE. by Prof. Nicholas Harkiolakis, Hellenic American University, GREECE. Modeling Muddy Flash Floods and Debris Flows. by Prof. Blaise Nsom, Universit?de Brest, FRANCE. 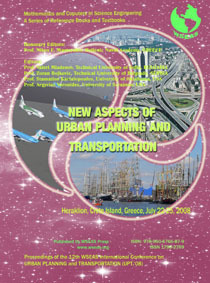 by Prof. Dimitrios G. Pavlou, Technological Institute of Halkida (TEI-Halkida), GREECE. On the eigenvalues optimization of beams with damping patches. by Prof. Veturia Chiroiu, Institute of Solid Mechanics, ROMANIA. In Depth Analysis of the Analogies among Entropy, Information and Sensation. The Concept of Time in Thermodynamics. by Prof. Vassilis Gekas, Technical University of Crete, GREECE. by Assoc. Prof. Manoj K. Jha, Morgan State University, U.S.A. The exploitation of the most recent historical cultural heritage for tourism development. The case of preserved buildings and grounds in Greece. by Prof. Eleni Stamatiou, Hellenic Open University, Greece. by Prof. Michelle Duffy, University of Melbourne, Australia. 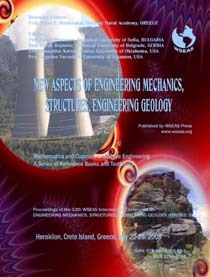 Editors: Nikos E. Mastorakis, Valeri Mladenov, Zoran Bojkovic, Dana Simian, Stamatios Kartalopoulos, Argyrios Varonides, Constantin Udriste, Eugene Kindler, S. Narayanan, Jaime Lloret Mauri, Hamed Parsiani, Ka Lok Man. 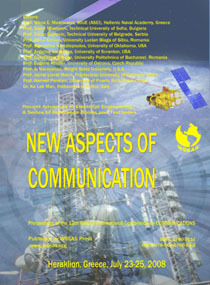 Editors: Jaime Lloret Mauri, Azami Zaharim, Andrei Kolyshkin, M. Hatziprokopiou, Athina Lazakidou, Michail Kalogiannakis, Konstantinos Siassiakos, Nikos Bardis. 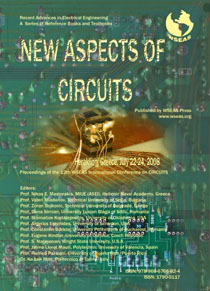 Editors: M.-K. Nikolinakou, George Tsekouras, Vassilis Gekas, Dimitrious Pavlou. Editors: Thomas Panagopoulos, Jon Bryan Burley, Selma Celikyay. 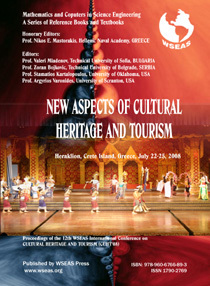 Editors: Vassilis Gekas, Nikos E. Mastorakis, Eleni Stamatiou.